The histogram on your camera lets you view the exposure of your photos so you will know whether your photo is too light or too dark. This is important since there are so many times that we cannot really see the image on the LCD screen because of bright sunlight. Or you may have your LCD set to a lower or higher brightness and therefore the image on the LCD will not look the same as the image downloaded to your computer. Histograms which represent an image that has all tones from the blackest black to the whitest white will look like an even hill as in the sample above. But if your image is over- or under-exposed, the hill will fall short of one or both ends as in the sample below. So how does this information help you? You can adjust your camera setting using exposure compensation (+/- EV) and take another shot that is properly exposed. Is my photo under-exposed or dark? To read your histogram to determine if the photo is under-exposed, press the info button on the back of your camera while playing back an image. You will see a graph like the one above. Look at the right side. Does the information (the black hills) go all the way to the right side? If it does not go all the way to the right, then your image may be too dark. Try “adding light” to brighten up your image by dialing in a plus (+) exposure compensation, such as +0.33, +0.67 or perhaps +1.0. Then take another shot and see if the right side moved further to the right. Is my photo over-exposed or too light? To check if you are “blowing out the highlights” look at the left side. If the information does not reach all the way left, you may not see any detail in the brightest parts of your image (think bride’s dress or facial features). Before making any correction, press the info button once again. You will see any that any areas that are over-exposed or blown out will be blinking. If a critical detail (like the face) is blinking, you will want to make a correction by dialing in a minus (-) exposure compensation, such as -.33, -0.67 or perhaps -1.0 to subtract some light from the image. 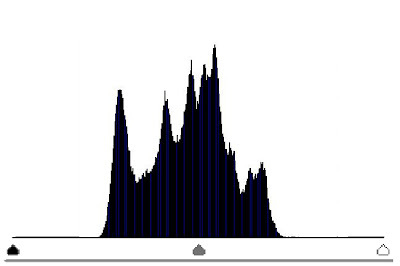 Keep in mind that the histogram is giving you a representation of the darks and lights in your image. If you take a photo out in bright snow and your subject is wearing light clothing, there may not be any black in the image and your histogram will naturally lean to the right making a an uneven hill. Making an adjustment in this case might lead to grey looking snow. Conversely, if your image is of a black cat in a low lit room in front of a brown wall, there may not be much white or brightness for the camera to record and the histogram hill will lean to the left naturally. Making a correction here might make the blacks look grey and you will lose the richness of your shot. So the histogram need not be an even hill from left to right. By checking your histogram from time to time during your shoot, you can be sure before getting you r photos onto your computer whether or not your exposure is on the money. To learn more about the histogram on your camera, consult the owner’s manual. Add information about the histogram to your camera bag by downloading the new Photo Tips Card: Histogram at right and adding it to the others on a D-ring.